Korea’s leading mobile network operators, card networks, phone manufacturers and government agencies have joined forces to provide shoppers in Seoul’s busiest shopping district with a wide range of NFC services including payments, couponing, smart posters and digital receipts. 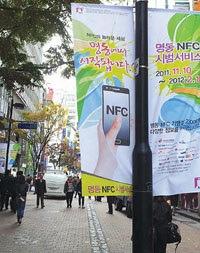 An NFC shopping zone has been opened in Myeong-dong — the busiest shopping area in South Korea’s capital city, Seoul — by the Grand NFC Korea Alliance, an association formed in June by the country’s leading mobile network operators, phone and device manufacturers, card issuers and government agencies. Payments at some two hundred merchants. Smart ordering in local cafes and restaurants, allowing customers to tap a tag to order a drink rather than having to queue up and wait for service. Smart posters that enable shoppers to download coupons and advertising information, including promotional videos. Movie ticket purchasing, along with downloading trailers and show time information from smart posters. Ticket checking at the theatre can also be done via NFC, and there’s a service that automatically sets phones to silent mode and turns off camera functions. Bus timetable information and real-time service status, downloadable via NFC tags located at bus stops. Collection of loyalty stamps, allowing shoppers to receive rewards once they have made a pre-set number of purchases from a store. Electronic receipts delivered directly to NFC phones as a legal replacement for paper receipts, using a recently agreed standard NFC receipt format developed by telecoms research institute ETRI. Over the next year further trials will take place, including a project at Seoul’s Incheon airport, the introduction of peer-to-peer NFC payments for independent merchants and the addition of public transportation ticketing applications.